The amazing Colleen Schaan made this great video explaining a little more about the Tracing Memories workshop. It is so easy and relaxing! Make your own works of art that mean something special to you. What a fun time I had last week teaching the Tracing Memories class in Anahiem! I got back after the CHA trade show and finally had a chance to catch up on my work. But, after all the emails, and business was over, I had fond memories of my trip to California. This is where I was able to use a bit of Tracing Memories to enjoy that experience once again. 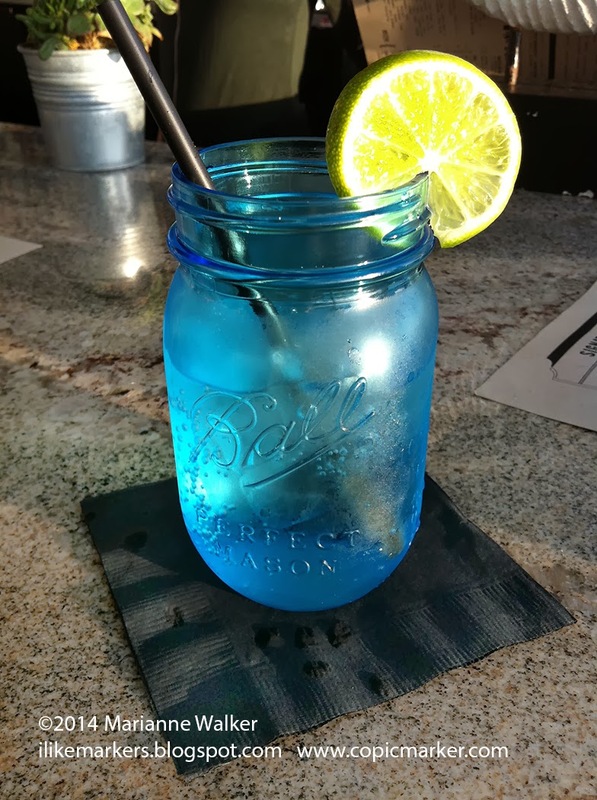 One evening, we had a chance to go out to dinner and I was served a Sprite in a really pretty blue Mason jar. So, of course I took a photo of it (I'm sure each of you have done something similar). The rest of the evening was great, lots of new people we met, stories we told, and good food was eaten by all. When I got home and dug through my photos, I saw that mason jar, and instantly thought of that evening and the fun we had at that restaurant. So, I decided to keep that memory alive and color the photo. 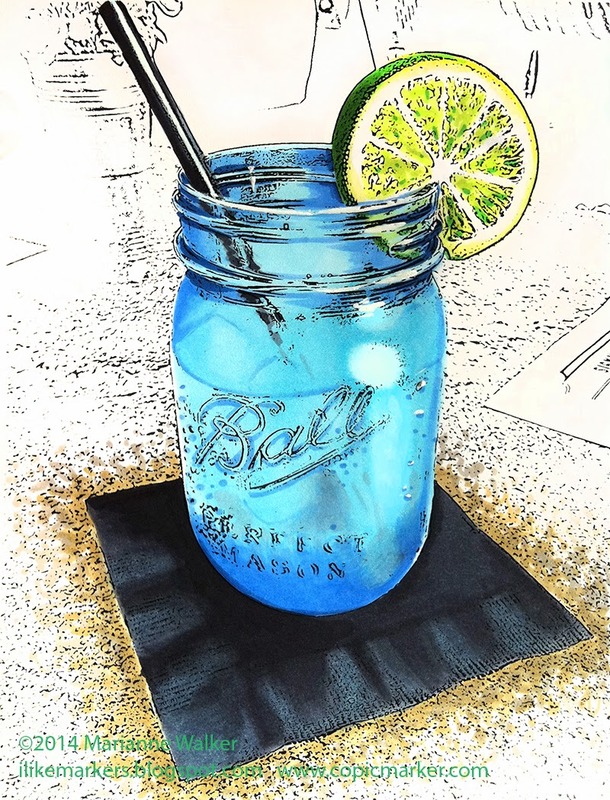 Here I am coloring the pretty blue mason jar. You can see my original photo that I'm looking at for color reference, but the coloring is all my own. Sometimes I print out my photo for reference, other times I will look at the computer screen, as the colors are more vibrant. This is where I made some artistic decisions about composition. The background of this photo is not as important, and I'm not going for photo-realism, so I chose not to color it. Rather than coloring the whole granite tabletop, I dotted on a few color to suggest the granite, and left it at that. The black napkin provides a nice solid, foundation for the jar, the blue really stands out, and the lime is vibrant and juicy. The condensation on the glass hid the ice cubes, so I "faked it" and drew in a couple pale blue lines to suggest ice-cubes without needing details. As you can see from the finished illustration, I love the final effect!! I printed copies of this illustration and gave them to each of the people from work who were with me that evening. As soon as they also saw it, they remembered the fun evening we had, and were so happy. I think, as a nice thank you, I should also send one to the restaurant. Have I inspired you yet? The people who came to my classes in Anaheim had an amazing time, and left very happy. I will be teaching more Tracing Memories classes in the next few weeks, so REGISTER NOW!! Then you can also learn how to color your own memories. This 4hr. class is low-key and perfect for beginners of all levels, so bring a friend, even if they aren't into art or have ever touched Copic Markers. Visit our website for more details, and to register. Feb. 21st Tempe, AZ Standard Certification taught by Sherrie Siemens almost full!! Feb. 22nd Tempe, AZ Intermediate Certification taught by Sherrie Siemens almost full!! Feb. 21st Orlando, FL Standard Certification taught by Lori Craig almost full!! Feb. 22nd Orlando, FL Intermediate Certification taught by Lori Craig almost full!! Register Now!! You will love learning from our talented instructors. Copic in the Craftroom: Blog Hop! Happy New Year!! I Have been working hard on some great things for the upcoming CHA show next week. Classes are filling fast, and I can't wait for an exciting 2014 full of new things. To Inspire Copic crafters, both new and experienced, to use their Copic products and get crafty. To Educate crafters, no matter their skill level, teaching proper product use for success and new ways to use Copic products. To Grow both as a community and as individual crafters. Crafting and coloring can happen anywhere- at a fancy desk, on your cozy couch, laying in bed, or sprawled on the living room floor (a few of my personal favorites). However, since I work for Copic, I wanted to share my desk at work. This is where I get my craft going! As you can see it is messy!! This won't be cleaned up until I leave for CHA, because that big stack of papers you see are almost all related to the new Tracing Memories classes starting up in ONE WEEK. Yikes! I love my big, spacious view of the trees and the Costco parking lot across the street. My craft supplies are all store in a set of drawers off to the left. I do have a full set of every color of marker, but those are for special occasions. At work, I usually have to use a very specific color range, so I have limited markers out at any time. The paintings are some I made last year for my office, to go with the color scheme of the rug and chairs. Because I write directions and tutorials, my computer plays an important role. But, the spot I use the most is my handy light table. This is my life. I draw with pencil, trace with a multiliner, scan, print, then color. I always keep scratch paper under my work when I'm at the coloring stage. Here is a picture that I am working on for the new Tracing Memories class. I have a photo of my daughter and my lucky pirate lunchbox to keep me inspired. I have a good, true white lamp for keeping colors accurate when I am working. I share my office with Nancy, our amazing Certification Director. She keeps the program running smoothly. She's an amazing friend and an incredibly hard worker. Love you Nancy!! I have a giant set of Ikea closets on the other side of my room. This holds paper samples, product samples, and packaging ideas that we've had over the years. At my little desk and chairs, visitors are always welcome. We have meetings, I do product training for whoever is curious about how our products work, and plan all sorts of great things to help you get more out of your markers. Again, more Tracing Memories stuff on the table (I hope you come to one of those classes this year, it will be awesome! ), reminding me I'd better get back to work. My desk at home is just a laptop, a rack of markers, a light table, and a scanner/printer. My husband is the one who owns the big, messy art studio at home- the kind of big room where you can throw paint, build an installation piece, have a disco party, or invite your cub scout group to take an art class from me. I love my markers! Most of the time, I am hauling sets of markers around the community, teaching kids art classes, Tracing Memories classes at the local retirement communities, and wherever else there are people who need more art in their lives. Wanna see more inspiring spaces? Check out the rest of the blog hop! Make sure you stop in at the Copic in the Craft Room Facebook page and share your own crafty space photos. Thanks for visiting my office! By the way, you can register now for my Tracing Memories class in Portland, OR on Feb. 15th. Two sessions to choose from, each are 4 hr classes, and only $99! I think you will love the new class! !